This trick is pretty simple to implement. All you need to do is snap a screenshot of the prank targets desktop or computer screen, then set that image as the screensaver on the Mac (or Windows PC if you’re pranking someone on that platform). That’s it. Now when the target of the prank goes to use their computer they will see a screenshot that appears to be of the desktop (or whatever else you screenshotted, maybe a silly web page or goofy document). 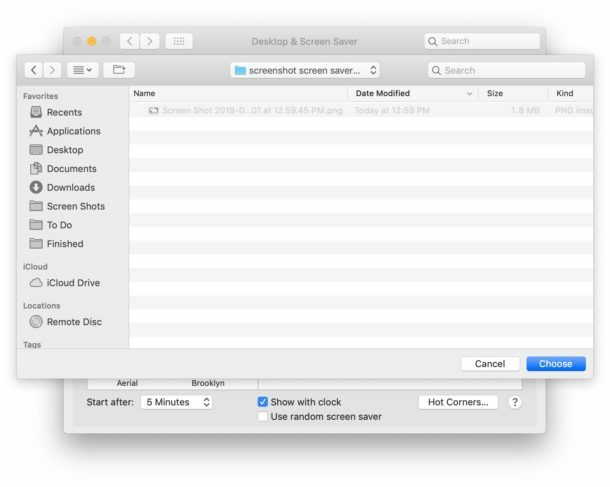 When they go to use the Mac, if they have a screensaver password set it will require the login to exit the screensaver, and if they don’t then the screenshot will immediately disappear which can make it seem like the desktop or whatever was on screen has changed. Just use your imagination. Remember it’s a prank, so it’s supposed to be funny and not mean. OK this is fun, what are some other simple tech pranks? There are a few variations of this particular screenshot prank. 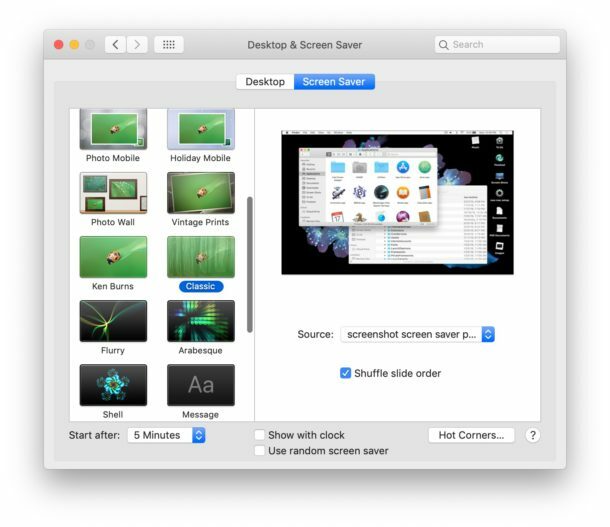 One is to capture a screen recording and set that video as the screen saver (this requires a free third party screen saver called SaveHollywood to play videos as the screensaver) which can be extra funny depending on what you record the screen doing (or not doing) on the Mac. Another variation of this prank involves taking a screenshot and setting that image as the desktop background wallpaper picture rather than the screen saver, which can be equally befuddling as someone attempts to interact with desktop elements, icons, windows, and apps that are simply a screenshot rather than anything actually interactive. Similar pranks can be achieved for iPhone, iPad, and iPhone by setting screenshots as the lock screen, by setting a broken glass picture was the lock screen wallpaper, or even setting an ‘iPhone is Disabled’ screenshot as the device wallpaper. The fun thing about these pranks is they’re usually enough to puzzle someone but are quickly found out. You can browse through our prior April Fools joke posts if you find this stuff amusing. Remember this is meant to be a joke, so don’t be mean! If you use this prank and notice that someone is struggling with the repercussions of a screenshot set as their screensaver, don’t be a jerk, tell them it’s a prank and fix it for them. Remember the fun of tech pranks is that they’re supposed to be briefly silly, and certainly not cause needless tech stress! 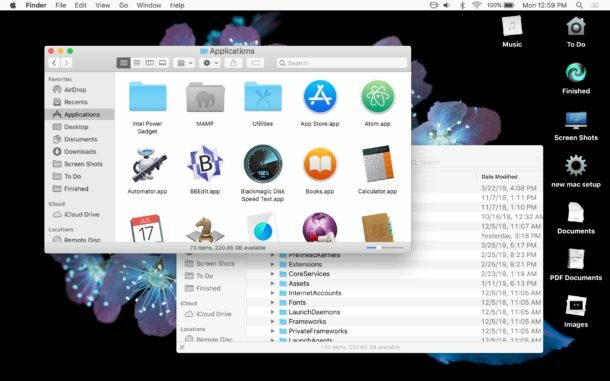 If you have any other fun or goofy ideas for April Fools pranks for Mac, Windows, iPhone, iPad, or Android, share with us in the comments below! Could replicate that today in a full screen Terminal with a little bash prompt customization! I’m not sure if this is possible, but if it is, it would be fun to do. In Australia, we’re just at the end of the really hot weather (in most of the country), but there are a few hot days here and there. I use my iPhone for my GPS/SatNav having it sit on the dashboard. It occasionally gets very hot and has to shut down because of overheating. Now this is the part that I don’t know whether or not is possible: it would be fun to have a screenshot of that overheating screen. If you can get that screen as a screenshot, place it as the lock screen – especially if you’re in a place where it is cool or cold weather. That should have the phone owner confused for some time. That’s a funny idea, I like that one! This one is always good. I used to do it to some of my clients, but I put the screenshot upside-down. They’d call me or call in a ticket and be all panicked. I’d tell them there’s no way that can happen, and they would have me come over and I’d tell them we have to put the display upside-down to fix it. I wish I had taken pics of the faces when I would say that! LOL! The upside-down screenshot idea is hilarious, thanks for sharing that prank idea! 3-Set their desktop picture to the screenshot you just made.